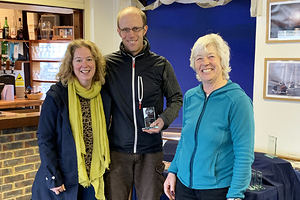 The 57th running of the Hamble Warming Pan was scheduled for the weekend of the 9th and 10th of March, and the competitors and volunteers duly turned up at the Hamble River Sailing Club for the pre-race briefing given this year by IRO Roger Wilson. It is not normal for the second days racing to be the major item on the agenda for the briefing, but, with some very; very strong winds forecast for the Sunday, it was clear to all that Saturday was going to be it for this Warming Pan. The fact that the club was celebrating its Centenary had no affect whatsoever on the Weather Gods. 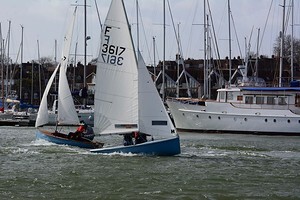 Even Saturdays weather turned out to be somewhat challenging, as Peter Vinton from Warsash found to his cost when bringing his Finn, Maggie, a couple of hundred metres up river to the start area. He opted, not entirely intentionally, for a pre-race capsize. Not only that, he managed to pick up a river mooring. Now those of us who have river moorings will tell you, that to pick one up first time in windy conditions with the tide running is no mean feat. Unfortunately for Peter, Maggie was upside-down at the time. He was soon surrounded by a gaggle of ribs eager for some rescue practice. Despite their attendance he was back upright for the start. Initially, the plan was to set a course that took the fleet out of the river to allow some windward leeward work in the Cat Head area. 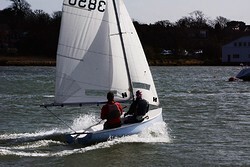 However, when the on water safety team of Peter Baines and Ken Munro went outside for a look, they decided that they didn't fancy the 25 plus knots and short chop that met them, let alone sending the dinghy fleet out try it. So, two marks were laid in the river. The fleet would start off the HRSC line and head south to a buoy off the "School of Nav", as the Solent University's Maritime Centre is still lovingly called. 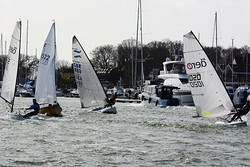 From there they would head up river to a mark off Hamble Yacht Services. They would complete this loop the required number of times. 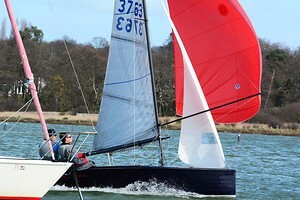 With the weather having deterred a number of boats from entering, the remaining competitors were combined into a PY start, except for the Foxers who mustered five hardy souls to race on their own course in the Warsash pool opposite the club. 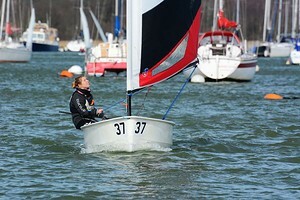 Nine boats started Race 1 in the PY fleet, though only eight made it to the first mark as one Firefly had issues keeping its rudder in the water and duly retired. Although conditions for the start were reasonably calm the vicious gusts soon returned to propel the Merlin, Fireflies, Aeros and Finn rapidly up and down the river. This led to an elapsed time of between 25 and 30 minutes for the whole fleet. Race 1 was won by Mark Barnes and Josh Wilce in the Merlin, Dancing Smiffy Brave. In second were Nigel Wakefield and Emilly Sanderson in Firefly 3007, followed by Bob Sherrington and Mel Sherrington in Iris, Firefly 3617. For Race 2, the second mark was moved further upstream to the vicinity of the Chinese Bridge, so that a longer course could be set. 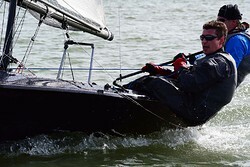 The conditions however had taken their toll and numbers were down for this race. The single handers all bailed out, even those who weren't tired of swimming during the Race 1 pre-start. Even the timing device on Dancing Smiffy Brave had become affected so much so that she started a minute early and due to the Black flag decided to keep to keep going anyway. With an elapsed time of just under an hour, the Firefly of Stuart Hudson and Sally Wakefield, Fursty Ferret, came home in first place. Iris was second followed by Firefly 3007 in what became a Firefly exhibition. The Foxers managed four races in the conditions and James Ross in MHGA won overall with three bullets and a second from Shuan Barber in Arctic Fox and Robert Macgregor in 97. "All contestants were awarded a prize, for bravery if nothing else!"